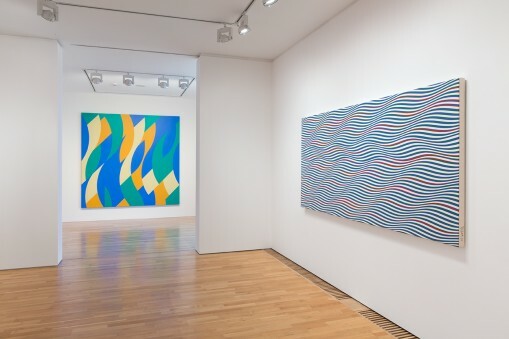 De La Warr Pavilion in Bexhill-on-Sea is currently showing Bridget Riley: The Curve Paintings 1961-2014, featuring more than 30 paintings and studies. Dany Louise takes a tour of the show with Riley and finds out more about her approach to painting and abstraction. 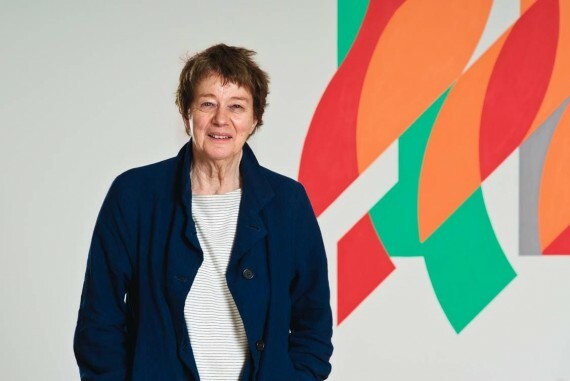 Bridget Riley is famously private and rarely gives interviews, so it’s a huge treat to be lead around her new exhibition at the De La Warr Pavilion and hear her talk about her work and development as an artist over a 50-year period. The Curve Paintings 1961-2014 brings together over 30 of her paintings and studies from throughout her career, with a focus on her use of the curve as an active way of dividing the pictorial plane. The show begins with famous early black-and-white works, such as Crest (1964), where her organisation of multiple ‘twisted lines’ creates an extraordinary sense of visual movement on a static and flat canvas. 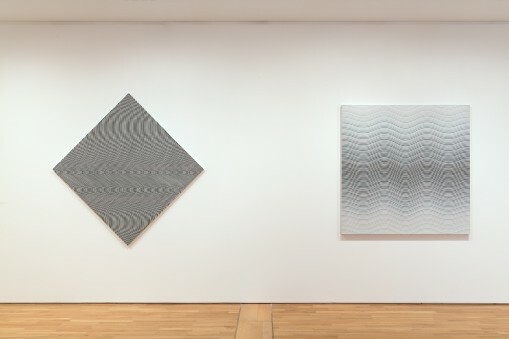 These early works lead to her becoming known as a key member of the ‘op art’ movement in the 1960s, but Riley has rejected this label feeling that it placed limitations on her scope as an artist. This exhibition demonstrates that her concerns have been considerably broader than this, with the enduring influence of art historical greats like Matisse and Mondrian apparent. Included are some fascinating drawings and gouache sketches which reveal how she plans each work. Drawn and painted on grids or graph paper, they are carefully labelled – ‘1st revision July 26 02’; ‘2nd revision July 26 02’ – with handwritten notes such as: ‘compensate by reducing VVM to 2 widths from 3’. Some of these are made using collage, faintly echoing Matisse’s famous late cut-out works, and in her conversation Riley talks about how Matisse has long been an inspiration for her. Her own discussion is notable for its use of the language of formal abstraction and the challenge of resolving painterly problems. Perhaps surprisingly, it becomes clear that – like Frank Auerbach (who was a contemporary of hers at the Royal College of Art) and David Hockney – she is ‘a painter’s painter’. She talks about the decision-making involved in dividing the canvas with curves, diagonals and verticals to create dynamic qualities of movement and volume, and startling or harmonious relationships between planes and colour. 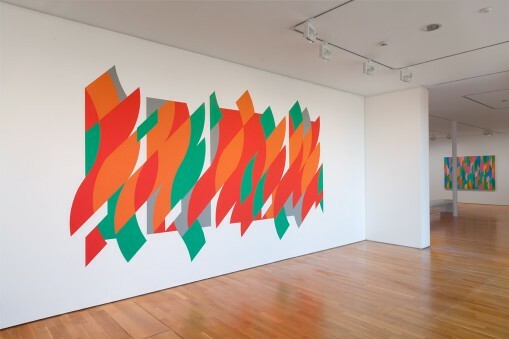 Wrestling with the potential and the problems of pure abstraction has been her life’s work: “Painting is a wonderful discipline and a great artform,” she says. What artists or movements have had the greatest influence on your work? I always took care to learn from the past, to look carefully at what other painters had done and why, at how they got there. Early on I was influenced by Futurism, especially its movement towards abstract thinking. I carried on with making my own sort of abstract work, doing much what Mondrian had done. You start from the simple things themselves – what a line can do, what a square or a circle can do – distorting shapes that were familiar to most people, putting movement through it, making them more active. I looked at Japanese prints and they’ve been a revelation. Monet had about 40 of them, and he painted his kitchen yellow in homage! There are no shadows, just printed flat colour and printed shapes and forms. They have small groups of colours doing different things and relating in different ways. I found them a very useful thing to think about. Introducing colour into your work was an important development. Can you say more about this? I was very interested in colour and I couldn’t find any way of beginning to understand basic colour relationships. I used to wonder, how did Matisse get to be able to make a painting like that? My painting La Lagoon is a transitional painting [made in 1999] when I was struggling to get the curve back, and in the struggle with planes and scale and so on, I realised I was looking at Matisse looking at Cezanne. This began a new body of work that has lead to Painting with Verticals  for example. You can see the violet movement going forwards and backwards and the blue movement embracing these colours and forms. Contrast is a very basic principle of my work, but I use a mixture of colour harmonies and colour contrasts to activate effects. I like the paradox that my paintings are flat volumes but you can look at the way the canvas is divided as planes, and the groups of colours as movements. What is your starting point when you are thinking about making a new painting? I start with the formal qualities of the pictorial space – composition, shape, volume, area. Introducing a vertical or a curve allows me a rhythm which is extremely important to hold it together, and a structure that I can move across, or break. You look at your old work, your drawings and paintings and think “where do I go from here?” Often you see a small connection. The stripe has long been an accompaniment in my work, as has the curve, which is open to more amazing changes than a straight line. The curve gives me exceptional freedom; its range is wider and bigger. But I reached the point where I could do no more with the curve, so I went back to the stripe. In the exhibition catalogue, Paul Moorhouse points out that I didn’t use curves for 17 years – I was very pleased to have my old friend back! Since I started working from the pictorial elements, one thing follows from another. Sometimes it’s a rich vein and sometimes you can’t see a way out of it, and that’s the time to stop. You started using assistants to make your works from a very early date. What are your reasons for doing that? I started using assistants back in 1961, and it was a sort of statement. I had a facility – that is, I didn’t find it difficult to handle pencils or brushes or materials. I was very comfortable with them and I learned to draw at art school. Now I have a team of people all of whom work part-time and who have come to understand my directions and they do not interfere. I have to be able to make decisions myself. Having worked in colour for a number of years, black and white is starting to appear again in your work. How do you feel about that? I was looking at an old painting, Tremor, which I made in 1961, and at the time I thought it had a lot of potential. But the second one was less, so I abandoned it and went onto other things. This painting has come into my life a couple of times since and looking at it again, I thought, “Aha! I know what I can do with that now that I have more experience”. I found a different type of movement entirely and made another painting [not in this show] – and there is 53 years between them!